This story is too cool for me not to share. Luke Winter aka Petit Prance. Luke Winter is a young creative from the UK. I met Luke while he lived in Montreal for a few years ago. We worked together for a short time, before he headed back to the UK. Last fall, he bought a typewriter and sat down on a public bench in London. Then a person stopped, and asked him to write them a story. 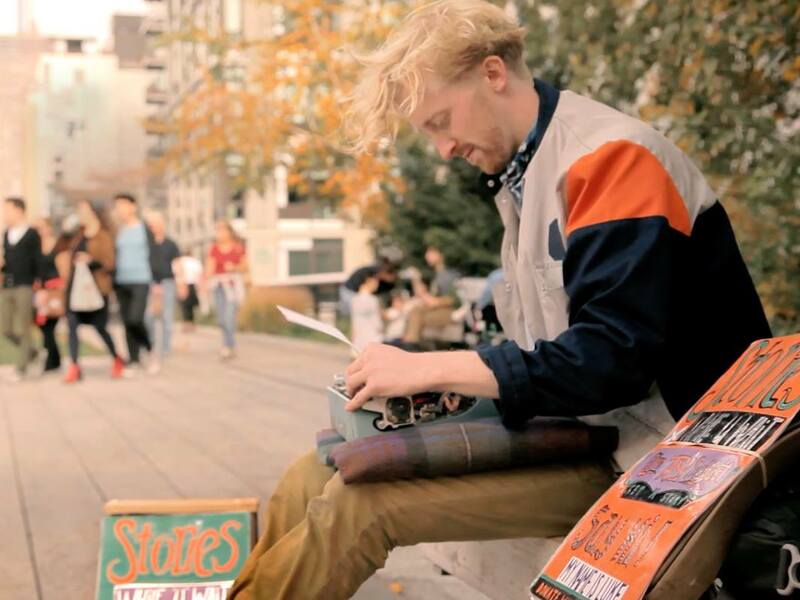 Since then, he has travelled all over Europe and the United States, sitting on park benches and streets, writing stories for thousands of people. He calls himself Petit Prance and hangs out in a random public place everyday. He has sat in a Texan desert, on the streets in New York City, on a promenade in Scotland, at a music festival in Paris, and by the Thames river in London to name few. He pulls out his typewriter, places a sign next to him that reads Stories While You Wait – Give Any Subject. And then, he just waits for passers-by to tell their tales, or simply give him a topic, and away he writes. Now, with the thousands of stories he has gathered and created, Winter is hard at work, hoping to share these stories with the rest of the world. He has launched a Kickstarter campaign, which if, successful, will allow him to publish a first edition of his book, Stories While They Waited. I asked Luke to tell me about one particular person who inspired him. He let me read the very liberating poem he wrote for Blanche, and I immediately understood how she felt reading it.